On Thursday, November 15th, Frisch students competed at the first Yeshiva League Poetry Slam of the year, hosted by the Rambam Mesivta, from one to three o'clock. The theme of the slam was "perspectives" and students prepared two pieces - one formal poem from the perspective of an ancient Jewish figure and one free verse poem from the perspective of a modern Jewish figure. Molly Lopkin (‘20) won the award for Best Poet and Seela Langer (‘19) won the Outstanding Poet award. Chloe Valdary, the Director of Partnerships and Outreach for Jerusalem U, spoke to the Frisch student body on Wednesday, October 24th, during fourth period in the shul. Ms. Valdary discussed her approach to dealing with the Israeli- Palestinian conflict, called the Theory of Enchantment. The Theory of Enchantment is a way of bringing together the opposing sides of the conflict by fostering empathy and compassion between them. Ms. Valdary was brought in as a part of Frisch’s Israel Advocacy program. On Monday September 17, Frisch held its annual Teshuva program in the shul during third and fourth period to inspire students before Yom Kippur. Following a story from the Gemara about redemption told by Rabbi Goldfischer, Rabbi Eitan Katz led students in a kumzitz. Students then went upstairs to the cafeteria to partake in the rest of the festivities, which for the first time included Dippin Dots booths. On September 20, the entire senior grade took buses to the 9/11 memorial museum at the World Trade Center city in Manhattan. The trip kept them out of classes between first and sixth period, but they had the opportunity to walk around the 9/11 museum and learn more about that tragic day. Kayla Forman ('19) stated, “The trip was both uplifting and meaningful, and I’m thankful to have had this experience.” After walking around inside the museum, the seniors were able to spend time outside by the 9/11 memorial pools that have the names of the victims inscribed on the perimeter of the two fountains. Frisch has changed the policy for student parking requiring that students display a parking pass in their cars if they wish to park in the student lot. Parking passes are available in the business office for students who provide the school with their names and the license plate numbers of the cars they plan on leaving in the in the parking lot. The new policy came into effect at the very beginning of this new school year. The Frisch building has physically changed over the summer with new lockers added in the freshman hallway in order to accommodate the class of 2022. Additionally, every classroom has been equipped with a new board that connects to the teacher's laptop, allowing the teacher to write on the laptop and have the writing appear instantly on the board. This allows teachers to use the display without being tied to the front of the class. Frisch kicked off its new school year on Wednesday, September 5, 2018. Students were greeted at the doors by faculty, music, balloons, and the Frisch cougar, the school’s mascot. Students were excited to reunite with friends and teachers and start a new year of friendship and learning. Between ninth and tenth period, Rabbi Ciner called for a grade-wide Mincha, “the macro-community of the yeshiva", as is the tradition for the first day. 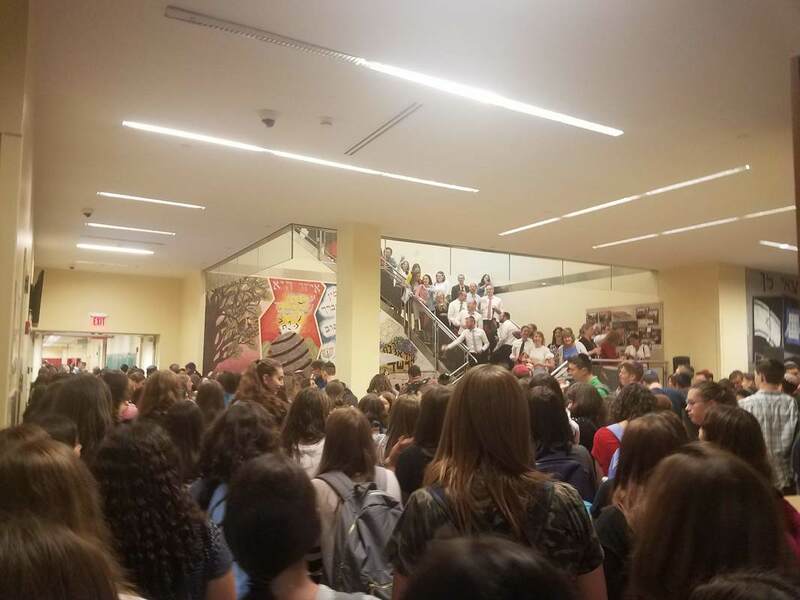 Following Mincha, the teachers stood on the main staircase and conducted the annual candy toss, throwing candy at the students below to create a sweet beginning of the year.